In case it SOMEHOW slipped your mind, Eebongbong is the planet the Eebs originated from. Ah, book #3. Off with a bang. Pre-press continues on for Spacetrawler book #2. The funds become available to me later this week, and I’m still on schedule to send it off to the printer on the day my account is credited. So, booh-yeah on that. Tired (been hitting the pre-press hard), but life continues well. Made some bread yesterday. Puttering away at writing a new cookie recipe. Still playing racquetball with my friend Kim (which has been a keen highlight for me). Spending downtime with my girlfriend watching bleak films from Scandinavia. The Swedish (well, and the British as well) Wallander series is great. And “Terribly Happy” was terribly good. I was a bit disappointed with “Kissed by Winter,” felt it was trying too hard, too polished (but pretty and well acted). I wasn’t very excited about “Varg Veum” either (although I only watched one episode). Looking forward to trying the “Irene Huss” series. If you count Iceland in there, “Jar City” and “101 Reykjavik” were both very good. “As It Is In Heaven” may be my favorite recently, although I can’t say technically it’s the best movie of the lot, I think it’s the sweetest and most interesting storytelling-wise. I want to see that graph. Joal spoke my thoughts before I could. I totally want to see that graph as well! Oops. But yeah, that was my point. I’m guessing they found the criminal… and it found them. The criminal not only is responsible for uplifting the Eebs, but downdropping the Ites into a tasty sandwich filling. We already know who found the eebs, so they might have been looking for him. what exactly is happening in panel three? is that a door in space? We know one thing that happened “shortly before the rise of the galactic Eeb industry”: an Eeb asked Qwahntoo for help, and Qwahntoo said he’d find something for the Eebs to offer in return. Sure, the criminal they were hunting might have been Qwahntoo, but it might just as well have been the Eeb. 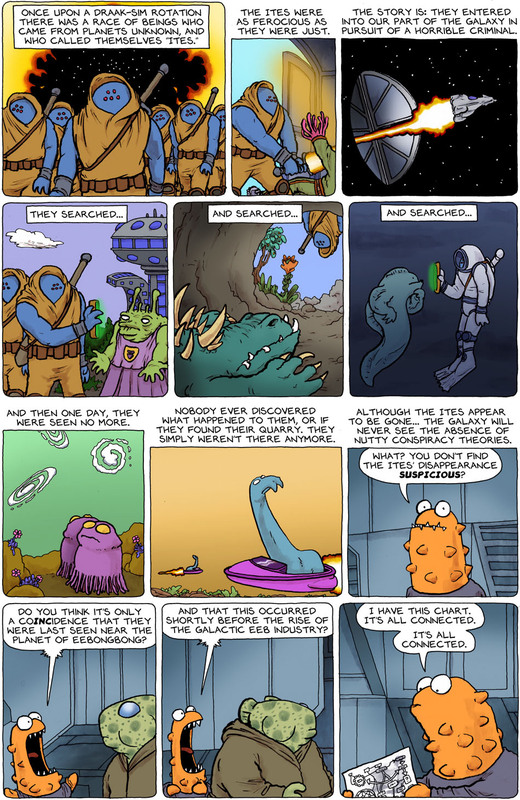 The Eeb was clearly facing some kind of problem, and that problem might well have been the Ites, which must be pretty powerful given that they could travel to another part of the galaxy before spacetrawlers were made. FurryITEs are tasty, supposedly. Have we seen a picture of one yet? I have to admit that panel three throws me for a loop, too. In particular, I can’t really get my visual perceptions wrapped around the drawing of the “door into space,” and how it’s supposed to actually appear three-dimensionally. As a result, I sorta “blipped” over that panel — but it irked me a bit because I’ve never had trouble with your drawings before, Chris. Am I the only one who had a few problems here? @Eris_Lobo, it’s a revolving door. Does that help? Maybe this horrible criminal invented the Pottybot? I’m sure Pierrot would think that a crime worthy of punishment! Great kickoff for the new book! I’m also a fan of all the Mhz network Scandi detective shows, so can we expect some darker themes to emerge in book 3? Love the wonderful variety of aliens in today’s strip! Especially the one in panel 5. Great work, Chris! “Revolving-That Door in Space”… I tought it a possibility, but was not really able to see it before the explanation. I`d say it needs some work if it is meant to be instantaneously understood. Fine Intro for Book 3. Christopher could have made the door look like an actual rectangular glass revolving door, making the joke much clearer, but it would also kind of tip the whole thing over into the Silly Zone. @invisifan, Brekt WAS off on her assertions about JFK. Really. No need to look any closer. @Christopher, all I can say is I hoped they closed that door. Otherwise all the gravity would leak out, and there we’d be — spending our money to provide gravity to the whole universe. Don’t leave the door open! And wipe your motivating pods when you come in from space — it’s not like I have all day to do nothing put push that vac-bot around after you. And wash your grasping phalanges before you consume biologic material! Do you think you were raised in an agricultural storage facility? Ooo! Could the Eebs’ being turned into spacetrawlers be part of a collective punishment for some REALLY bad thing they did earlier? Especially if the Eeb mind is passed on through generations, so each generation is still guilty of whatever massive crime? Just a thought. @JKCarroll – When I was your age, I slithered to Brain Mediation uphill – both ways! Bare-podded and with a grokmor on my dorsal! Thanks, @Angel, so much fun to play with silly designs. @WellWellWell, you hit the nail on the head. It was NOT “meant to be instantaneously understood.” Mostly because it’s not particularly important, and will be shown (and explained) later. @Griech, how fun! I think S3E1 it is due out in April. I’ll, um, look for you? Wait . . . Panel 6, that’s not the larval form of Nogg is it? The Ites didn’t disappear! They just grew lots of fur. And became delicious. See? Looks just like ’em. LOVE the door in space! Sorry @Eris_Lobo and @WellWellWell but I got it right away. Also love the alien’s reactions in panels 4,6 and 8. Chris, you are just perfect at conveying emotion in your drawings. Maybe I’m reading this too literally, but I’m thinking there is actually a criminal, which would mean that criminal is Qwhantoo. This has a whole bunch of interesting implications: Firstly, Qwhantoo is from a distant part of the galaxy; a part of the galaxy that has learned to make giant revolving doors appear in space! Secondly, literally anything could’ve happened to the Ites; being killed and being turned into furryites are just two possibilities. They could also have been brain clamped, be hiding, or have been turned into Spacetrawlers! They could also have created another revolving door and have gone to any other part of the galaxy! Third, Qwantoo is a criminal… but now has diplomatic immunity! Is the whole GOB just a giant shield for him? Hm… any chances we’ll see more of her JFK theory? Maybe the Ites found what they were looking for, an one they didn’t survive or two they left to where ever it is they live. Or three they got lost or found another trail to some where’s else. First: Scientifically nothing can ever be proven! second: A theory is a theory, and nothing more – wether it has aliens or relativity as its subject. @Chris — Yes, the “revolving door” comparison definitely helps! Thanks! Ooo thoery time. Qwathoo was their target and he enslaved the Eebs as a means of stopping them.